The long sought after Kaweco Squeeze Fountain Pen Converter has finally arrived! 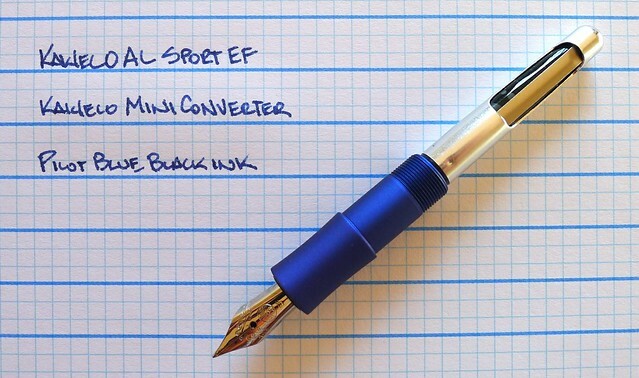 This mini converter gives users much more ink flexibility with the popular Kaweco Sport series of fountain pens. I had been saving my old empty cartridges and syringe refilling them if I wanted to use other interesting inks in my Kaweco's, but this converter will likely replace that. I think I need more practice with it though because I am only able to get about 1/2 the converter full so far in limited testing. Let me know if you pick one of these up and what your filling experience is like. Posted on April 25, 2013 by Brad Dowdy and filed under Kaweco, Pen Reviews.